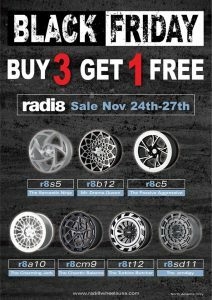 Radi8 Wheels USA Black Friday Sale for all models. 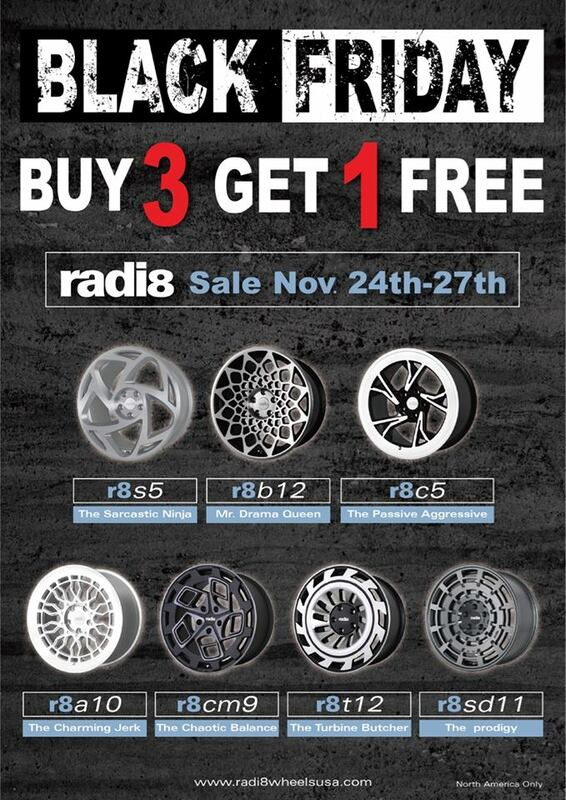 Buy three wheels get one FREE!! Please contact us for more information. Come in or call Monday to reserve yours! These wheels are the biggest upcoming wheel on the market. Come in and see their line up in our show room. These unique designs will set your car apart. These wheels come in many different sizes and offsets for your European or Japanese vehicle. Radi8 is a brand manufacture thrive to develop unique wheel designs and always continue to innovate new ideas. The passion of pursuing perfection and capability based on our many years of R&D experiences that lead us to make many breakthroughs on wheel design. Free Alternator & Battery Testing! Do you think your battery may be failing? Is your car staring really slow or making a clicking sound, then starting? At Meister Werks European & Import we will do free battery testing on any car. Not only that, but we have your European car battery in stock as well. Over the past 3 weeks we have changed countless amounts of batteries. We even ran out at one point, calling our Interstate Battery rep to deliver more batteries. We currently have a Snap-On battery tester which makes it a very simple procedure. On most cars, you can be in and out within minutes. Our battery tester scans for many other things than just voltage. It tests cold cranking amps (CCA) voltage and alternator charging while the car is running. It will even say wether or not the battery is stable, aka able to hold and keep a charge. One other thing about failing batteries, they can damage your alternator. The alternator is the part that charges your battery. A normal battery should hold between 13 volts and 14 volts. If that battery can only hold a 12v charge, your alternator will kick into overdrive, fighting to charge it to 14v which, over time, will damage the alternator. Swing by Meister Werks any time, call 425-254-0627 or email us with any questions. Meister Werks European & Import is located one block south from The Renton Landing in Renton, WA. 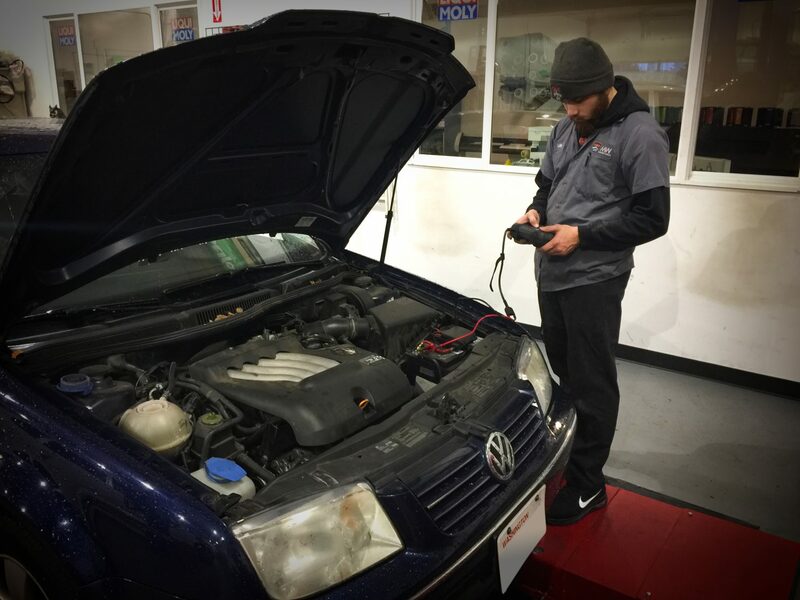 http://www.rentoncarrepair.com/wp-content/uploads/2017/11/Battery-Testing-1.jpg 2448 3264 Meister Werks http://www.rentoncarrepair.com/wp-content/uploads/2016/11/MW-logo.png Meister Werks2017-11-17 00:40:322017-11-17 00:57:04Free Alternator & Battery Testing! 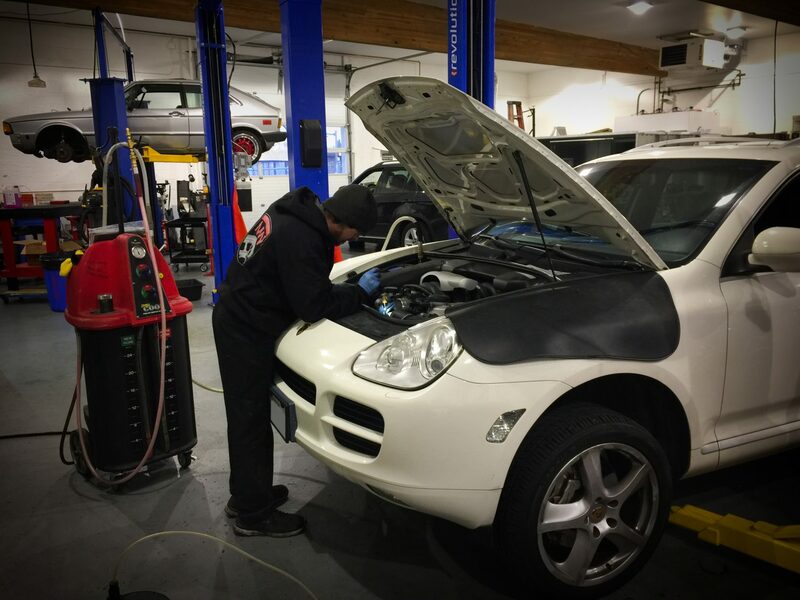 The other day this Porsche Cayenne received an oil change, brake flush, and coolant flush. When this Porsche Cayenne was in for an oil change we did our courtesy 30 point inspection on it. We found that the coolant was only good down to 0ºF, but it should be -22ºF or lower. We also found that the brake fluid had a moisture content of over 4%, which should be much lower, around 0-2%. This means that the antifreeze and brake fluid needed to be changed ASAP before the coming winter. We started by draining all the old coolant / antifreeze out of the Porsche Cayenne. We then hooked up our coolant machine and flushed good coolant though it until it was a nice pink clean color. This Cayenne uses a special coolant that is imperative to use, or else other damage may occur. Green over the counter coolant / antifreeze should never be put in these Porsches. If the wrong coolant is used, the chemicals can eat away the aluminum in the cylinder head, radiator and heater core, this will cause corrosion. Using the wrong coolant / antifreeze will cause problems down the line such as clogged radiators, damaged heater cores and damage the water pump, among other things. Next, we flushed out the brake fluid. This fluid should be the color of honey and not be dirty what so ever. If there is dirt or moisture in the system, it will decrease braking performance and brake down the seals in your brake master cylinder and calipers. If you need your coolant or brake fluid flushed, call us at 425-254-0627 or email us to make your appointment. Meister Werks European & Import is located one block south from The Renton Landing in Renton, WA. Wheel spacers are designed to push the wheels out a little more from the stock location giving your car a more flush look. 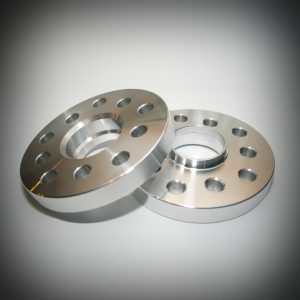 These Simply Spacers wheel spacers are made just for Meister Werks. These spacers are made from 6061 T6 aluminum and are made from the same heat treated aluminum wheels are made from. This week we organized all of our wheels spacers. We have a plethora of thicknesses and sizes in stock. 5, 10, 15 and 20mm are in stock. We have spacers for 5×120 BMW, 5×100 & 5×112 VW /Audi, 4×100 VW and 4×108 Volvo. On sizes over 5mm, you will need longer or extended lug bolts. We have many sizes and lengths in stock as well. 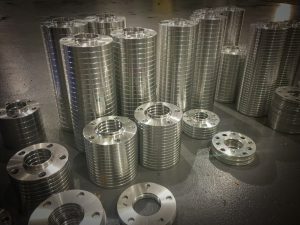 40mm – 50mm cone or ball seat and 12 x 1.5 and 14 x 1.5 thread sizes. Next, our spacers are also guaranteed to be perfectly hub centric and balanced. These are not like the cheap ones you buy at the auto parts store. They are machined to an exact specification to fit your OEM hubs with no problems. Call 425-254-0627 or email us to get your spacers today. Meister Werks European & Import is located one block south from The Renton Landing in Renton, WA. We are open from 9am – 6pm M-F and 10am – 3pm Saturdays. We will even ship them directly to you for $6 for a set of two. 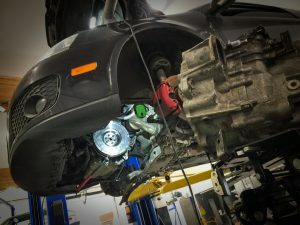 On Monday Zach knocked out a Stage 2 South Bend clutch on this Mk5 Volkswagen GTI. Previously, the customer had called to get a quote to replace this on his car. Little did he know that upgrading to a more performance part was only around $150 more. This type of upgrade is very nessesary if you are doing a chip tune or performance upgrades, The factory clutch is not capable of handling any more than 250 horsepower and will wear quickly if not done. The car was towed in last week and diagnosis was confirmed by our tech. We pre-ordered the clutch before the car had arrived and it arrived the next day. 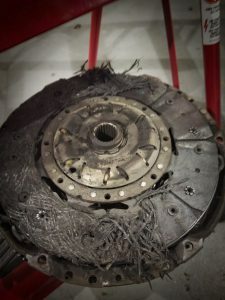 When we removed the transmission there was a plethora of “spaghetti” all over the flywheel and pressure plate, as you can see from the photo. We installed the new South Bend clutch, as well as the rear main and input shaft seals. These are easy and highly recommended seals to replace while doing this kind of job. These additional repairs insure that you will not have to remove the transmission for these kind of repairs again. After securing all of the transmission parts on the GTI, we replaced the right axle shaft due to a very badly torn CV (constant velocity) joint boot. This was also something that did not cost the customer any additional labor to replace, since the axle was already out of the car. If you need your vehicle’s clutch done, contact us by phone at 425-254-0627 or email us. Meister Werks is located at 618 Park Ave N, Renton, WA, one block south of The Renton Landing in Renton, WA. As we’ve said, we always get the same cars in twos. Last week it was two BMW X5 SUVs. 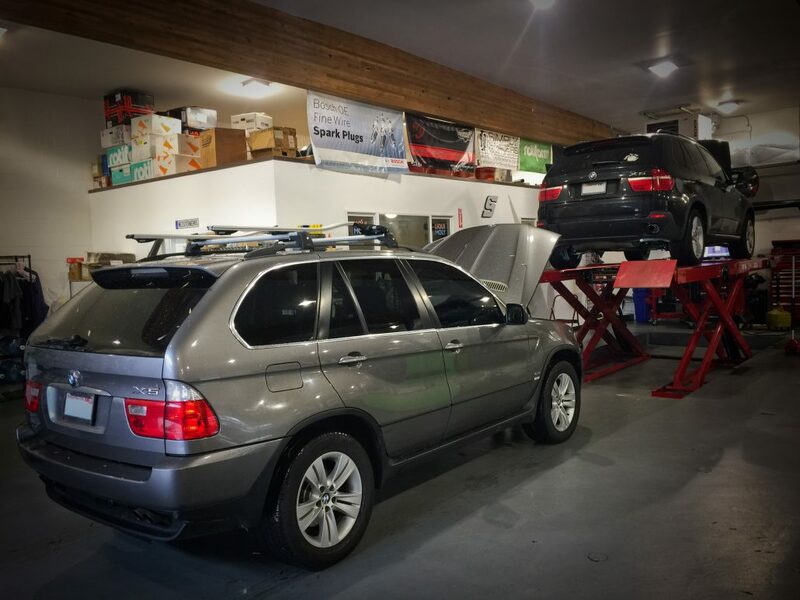 The black BMW X5 was in for oil leak on the drain plug, brakes and brake fluid flush. The silver BMW X5 was in for misfiring. After a thorough inspection we found that most of the coil packs were failing. The X5 is a mid-size luxury crossover produced by BMW. The first generation of the X5, with the chassis code E53, made its debut in 1999. These platforms are known for their cooling system issues. Water pump, thermostat and coolant reservoirs are a common fail point. Next issues we see are oil leaks. Valve cover gaskets are very common and should be taken car of ASAP. If you don’t, you will have oil leak all over the engine which can break down seals, hoses and other engine components. Using the correct coolant is very important. If you don’t use the correct coolant, it could corrode everything in your cooling system. Brake wear tends to be higher than other vehicles. We commonly do brakes on these platforms. Due to their weight, they tend to wear out rotors faster than other vehicles as well. Modern day rotors are made with a softer compound and the pads with slightly harder. This increases brake wear requiring you to replace all of the components when we do brake jobs. The last thing we see a lot of is coil packs. They are notorious for coil packs failing. Bad coil packs will cause misfires and is very common. Call 425-254-0627 or email us to make your appointment. Meister Werks European & Import is located one block south from The Renton Landing in Renton, WA.